Harvard grad leads Bills to first victory, and other football musings. On Sunday there was an epic battle of the beatens, with the Buffalo Bills, winless in eight starts going into the game, hosting the 2-6 Detroit Lions, who hadn't won a road game in 24 tries. Both teams were playing with backup quarterbacks, having lost their starters to early season injuries. The game was played on a chilly, rainy western New York day, and culminated in a 14-12 Bills win. 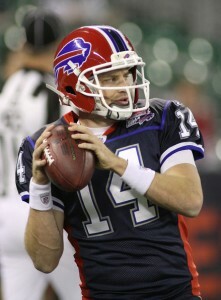 The Bills' QB for this, and for six previous games, was Harvard alum Ryan Fitzpatrick. Despite the six losses, Fitzpatrick played well enough that, going into the Detroit game, Forbes magazine rated him the NFL's best QB for the buck. Who said Harvard grads can't be cost-effective? Fitzpatrick's success got me thinking: how many Ivy League players had made it into the NFL in recent years, defined for me as since I was in college, i.e. since the mid to late 1960s? As luck would have it, a quick Google search got me to the blog of someone who has listed all the Ivy players drafted by NFL teams from 1967 through this year. They number 81; more than I had expected. The majority of these players were seventh or later round picks, and most, I'm sure, never made the team rosters. Fitzpatrick was a seventh round pick by the Rams in 2005. He saw little action in two years in St. Louis, then went to Cincinnati, where he appeared in 13 games in the 2008-9 season, then to Buffalo, where he had ten appearances in 2009-10 and seven so far as a starter this season. Over this period, only two Ivy players were first round picks. Calvin Hill, from Yale's great 1968 team, is the only Ivy grad to have achieved stardom of those drafted during these 43 years. He was the first Dallas Cowboy running back to gain over 1,000 yards in a season (1972), a feat he repeated in the following season. (One of Hill's predecessors as an Eli running back, Chuck "the Truck" Mercein, was drafted by the Giants in 1965 and had an undistinguished career except for his heroics as a Green Bay Packer in the 1967 "Ice Bowl" NFL championship game.) The other was Columbia QB Marty Domres, taken in the first round of the 1969 draft by the Chargers, but never a great success with them or, subsequently, with the Colts, 49ers or Jets. One second round pick, Cornell RB Ed Marinaro, taken by the Vikings in the 1972 draft, achieved at least minor stardom in the world of film and TV after six lackluster seasons in the NFL. You can see him as Coach Marty Daniels on Blue Mountain State. On other football matters, this must be the first time in I don't know how long that Florida has not been in the AP college football top 25. The Gators dropped off thanks to a loss to former coach Steve Spurrier's South Carolina Gamecocks. The Central Florida Knights were knocked out of their brief first appearance in the rankings by a loss to Southern Mississippi, which led me to think this would be the first time in God knows how long that no team from the State of Florida was in the top 25. However, the Miami Hurricanes snuck back in at 24th on the wings of a 35-10 thrashing of Georgia Tech. My South Florida Bulls, 6-3 under their new coach, Skip Holtz, get a shot at the 'Canes on the 27th, but first must face the always-tough Pitt Panthers.